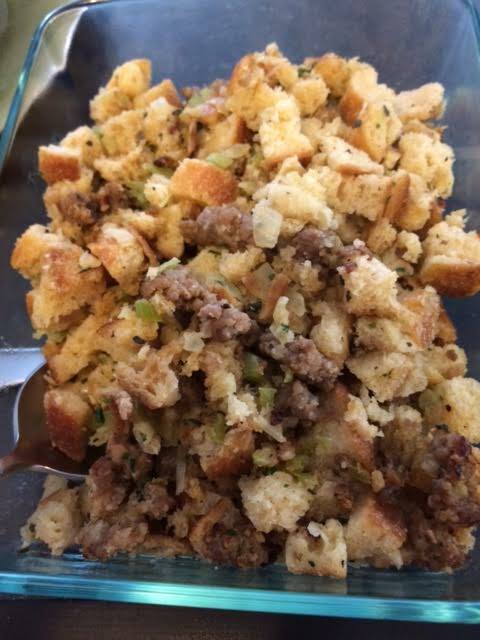 Sourdough Sausage Stuffing | Om nom nom! This is my absolute favorite stuffing recipe, and I don’t know why I’m just now getting around to posting it…I make it every year! Probably pretty much my favorite thing at the Thanksgiving table. This is a Cooking Light recipe from eons ago, and the only thing I ever changed about it was to use all chicken stock instead of half stock/half water. Well, and to change up the sausage…hot Italian is awesome with this, but so are various herb sausages…you really can’t go wrong. I will say to be careful of the moisture level – it’s very dependent on how large a loaf of bread you use, etc. I usually find I only need 2 cups, but you can go up to 3…I also like a slightly crisper stuffing. Can’t say enough good things about this one! Arrange bread in single layers on 2 jelly-roll pans. Bake at 350° for 20 minutes or until golden, rotating pans after 10 minutes. You can toss with a bit of olive oil and kosher salt if you like. Turn oven off; leave pans in oven for 30 minutes or until bread is crisp. Melt butter in a large skillet over medium heat. Add onion and celery; cook 11 minutes or until tender, stirring occasionally. Transfer vegetables to a large bowl. Add sausage to pan. Increase heat; sauté 8 minutes or until browned, stirring to crumble. Remove sausage from pan using a slotted spoon; add sausage to vegetable mixture. Stir in bread, herbs, and pepper; toss. Combine broth and egg, stirring well. Drizzle broth mixture over bread mixture; toss. Spoon mixture into a 13 x 9-inch glass or ceramic baking dish coated with cooking spray; cover with foil. Bake at 350° for 25 minutes. Uncover and cook 20 minutes or until browned.